The majority of Children's Playgrounds that are in the area I live offer a small fixed set of activities. Here are play spaces that offer a far greater variety of activities for kids to do. "While there are so many amazing playgrounds for kids to do stuff in," says Rockwell, "most of them have a very similar play experience. A lot of them are linear and there is mostly fixed equipment." The nearest NYC playground to me offers a total of 1 children's activity. The nearest Children's library offers thousands of books. 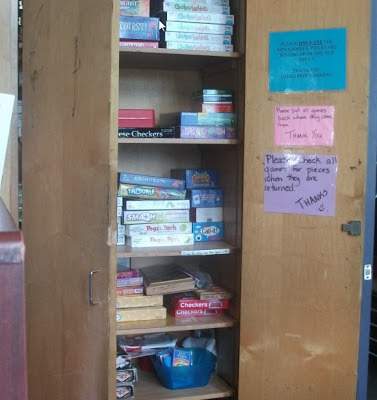 A Equipment locker is like a library for play. Adding one to a playground greatly enhances the play possibilities. There are 2 Hula Hoops, 4 Nok Hockey boards, 1 ping pong table and a Trouble game all being played in this area at them moment. All of these objects are portable allowing new ones to be swapped in and old ones swapped out in a minute. 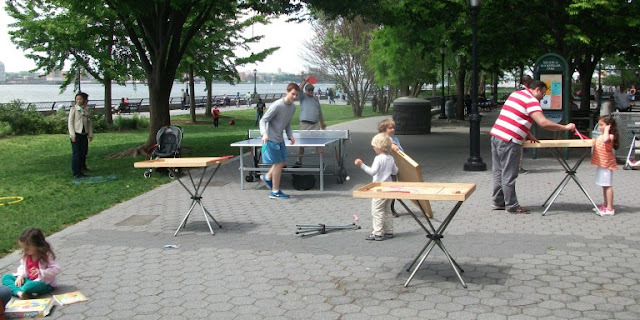 All 5,000 children we've interviewed want these very same, natural play opportunities. 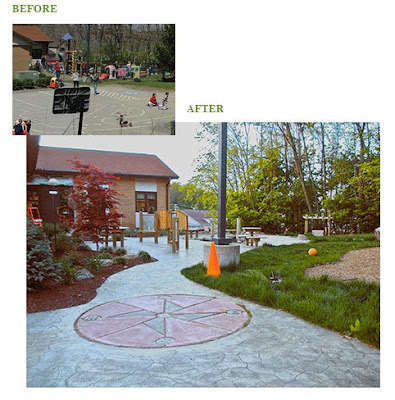 Offer them a choice, and every time they'll choose Natural Playgrounds over equipment playgrounds (see "a child's perspective"). At adventure playgrounds children get to play how they choose; they are not limited by fixed play equipment or by organized activities or games. Children are given the safety of an enclosed supervised environment. Playworkers are always present to mediate disputes between children and help them when necessary. The Uni Project is dedicated to expanding a culture of learning beyond the walls of schools and libraries and into public space.